Marvin Miller, Ph.D. has been selected for induction into the American Chemical Society (ACS) Division of Medicinal Chemistry (MEDI) Hall of Fame during the ACS 252nd National Meeting and Exposition in Philadelphia in late August. 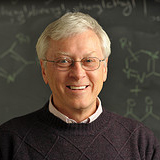 For nearly 40 years, Professor Miller has made countless contributions to medicinal chemistry, focusing on a mixture of synthetic organic chemistry and bioorganic chemistry to develop new methods in an effort to study, prevent, and cure disease, in particular tuberculosis and malaria. Professor Miller joined the College of Science in 1977 after receiving a Ph.D. In Bioorganic Chemistry from Cornell University and following postdoctoral work at the University of California-Berkeley. In 1996, Miller was named the George & Winifred Clark Professor of Chemistry and Biochemistry at the University of Notre Dame. Originally published by Tammi Freehling at science.nd.edu on August 05, 2016.